BTX Technologies is distributing the Reach US line of products, which synchronously captures multiple HD, SD or VGA inputs at full resolution for streaming live or on-demand over IP enabled networks. Each Reach US product is a multi-streaming device which can capture a wide variety of inputs. These inputs can be slide shows from projectors, computer feeds, mobile devices, cameras, microphones, medical equipment, and video conferencing systems. Feeds can then be viewed live or on-demand. Because of the solutions unique multi-streaming technology, the viewer can dynamically choose a layout best suited for their requirements - by watching a composite of all captured streams or select only those that are of interest. The streams can be reviewed at original resolution or at a lower bit rate when necessary. The Reach US solution features hardware platforms embedded with an operating system for high reliability and easy maintenance, allowing for a flexible and scalable solution good for any size project. 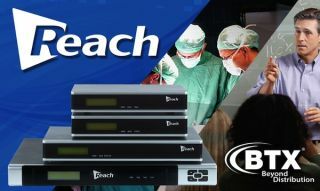 BTX is offering lunch and learn live demonstrations of Reach US solutions.